January | 2014 | Where's your head at? 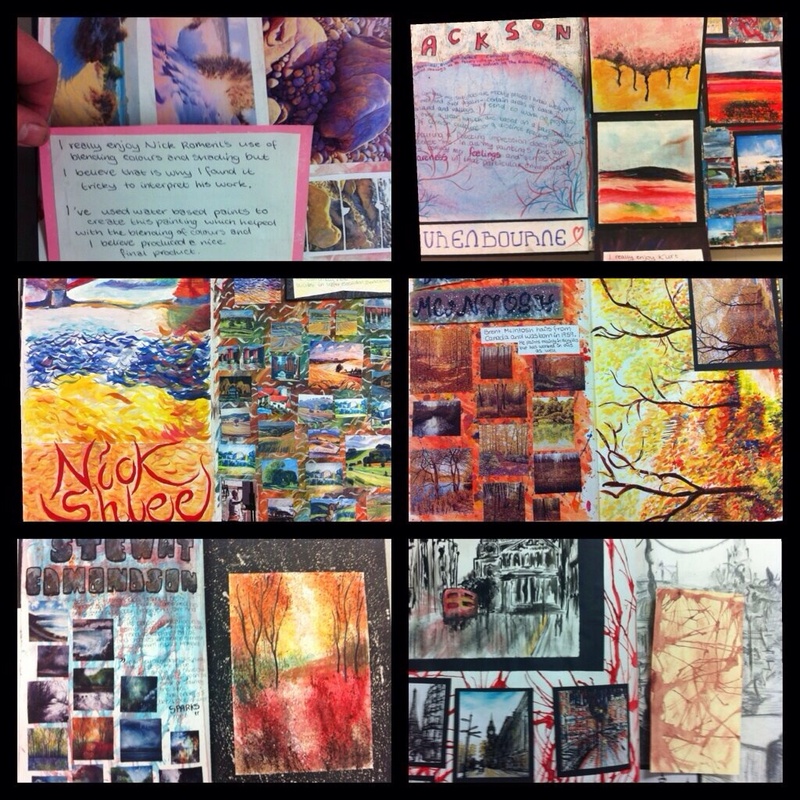 Quite a few twitter followers have been asking me about how do we get such beautiful work from our students and others have been asking me to share ideas about critique. I have to say, there is a multitude of great blogs and useful videos on this subject, but here is some advice which I live by. Establishing a really clear, co-constructed success criteria for ongoing work is absolutely essential for students to have a platform for effective critique and a view of excellence. This can be effectively done in two ways. 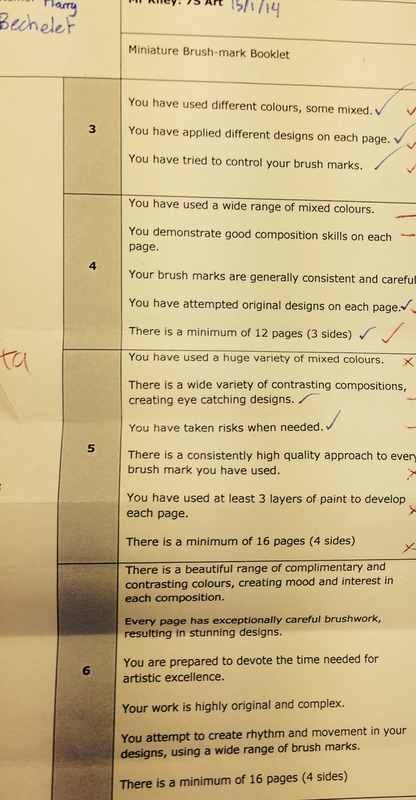 By using exemplar work of excellence from previous students, you can pick out the key criteria for work of excellence. Address the hallmarks of excellence in the work. What is it that makes this work so very special? How might this help devise a success criteria? First timers, make sure you know what excellence looks like. I remember reading David Didau explaining how he would often write the same essays as the students in his class, often at the same time to get a feel for the level of challenge, where the pitfalls might be and how to write the essay successfully, I also remember him writing about PBL a while back and recognising the importance of doing the work yourself first. If it is a new project, then the teacher should create all the elements of the learning themselves to provide a benchmark from which to agree the criteria. Exemplar work from similar projects can also be used to help create a meaningful success criteria. As teachers, we are, or at least we should be the greatest exponents of this. We reflect on the quality of our teaching and provide meaningful success criteria for ourselves to judge whether we are doing a good enough job of teaching the little blighters. 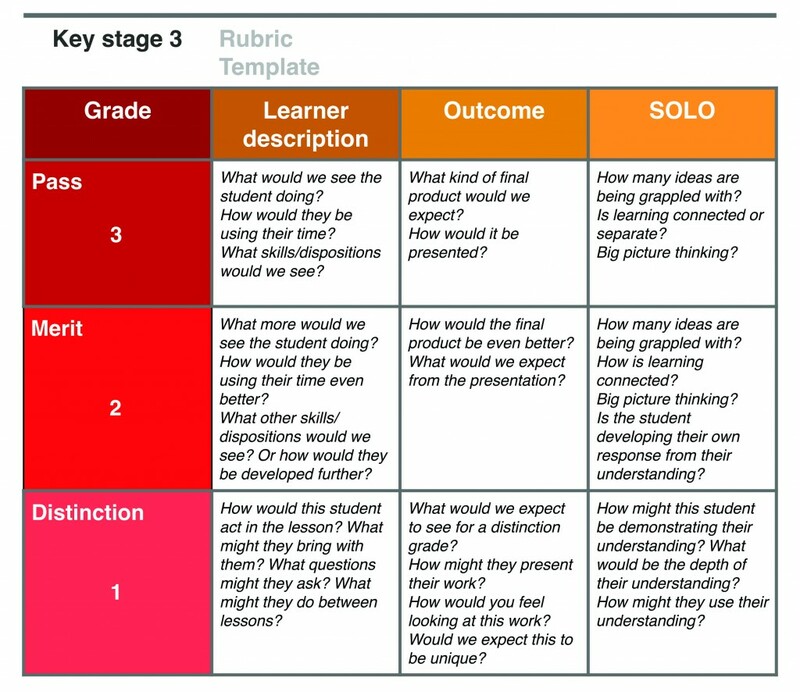 For students and the teacher to build the success criteria as the project develops, there is a need to highlight learning excellence as the students develop their work and building a more robust criteria on the work as the lessons develop. The questions are for the teacher to ask the students to help build an agreed format of assessment. Rather than just critiquing the physical outcomes of learning, we are now using SOLO to critique and question the depth of learning; whether concepts have been explored and understood. Does the work combine elements of understanding together? Does the work demonstrate a more complex analysis of the project concepts? Has the student developed their own conceptual understanding through the project? The importance of talking, demonstrating and exploring nothing more than excellence. I loath Must, Should, Could. The laziest and most pointless way of differentiating a task I can think of. If you want to give kids a get out clause for challenging work; this is it. I’m really not keen breaking down work of excellence into level descriptors, but this is something my school will not get rid of. So as you will sadly see, this is something we still do. rarely speak about anything below a 6. Always believing they can all reach this. Never diverting from describing the work of excellence; what are the skills, aptitudes and work ethic for this to happen, what is the language of excellence expected is absolutely essential to accomplish greatness, or at least to understand the path to greatness. Talk of excellence in your subject; use the language of excellence in your subject, surround your students with excellence, create clear pathways for excellence to flourish, provide the climate and culture for excellence to permeate your students beliefs and expectations. Through building a learning environment which addresses this learning culture, it’s more than likely that students will give critique which allows excellence to be the norm. I picked this idea up from a HTH video I watched a couple of years ago and have since tweaked to fit in with how we work at my school. 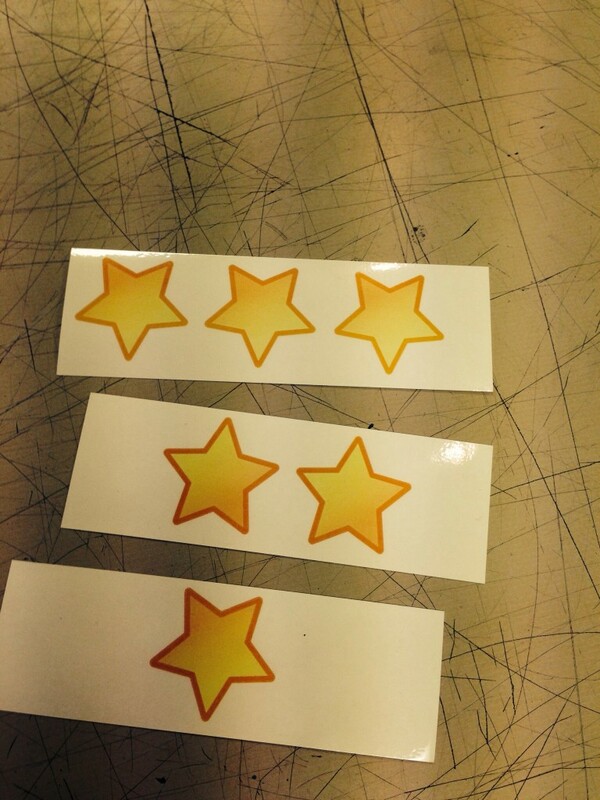 Each student has these, armed with their success criteria, look for excellence. During a project, where we have developed a success criteria, we ask students to decide on the 3 pieces of work which they feel are closest to excellence. I remind students of the success criteria, and we discuss examples of what each strand of the criteria looks like to ensure they understand. From this discussion, work is displayed around the room; you could use pegs or pins on the wall. I have set up my classroom and played This track (amazing how many kids know what it is) to get the process going. Through careful scrutiny of each piece of work, students decide on their top three; three stars to their 3rd favourite, 2 to their second and one to the piece where they feel excellence is closest. 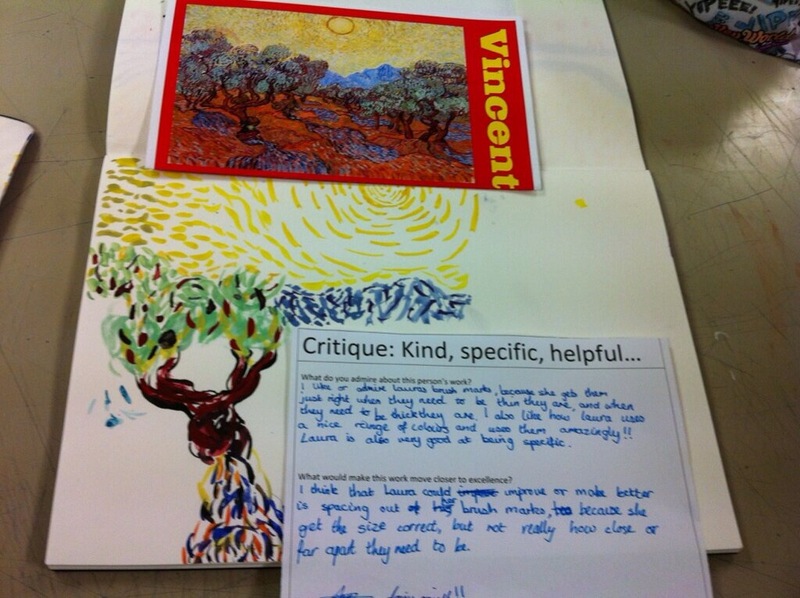 The work of students who have the most commendations from students are then assessed as a group to find why these pieces of work are closest to excellence, what we as a group can learn from them and how even the best work can be even better. This is a great opportunity to use Apps such as explain everything to record the dialogue of assessment. Another string to the success criteria bow. This dialogue allows everyone to see what are the key traits which are creating such excellent work, but also allows the very best to see what they can do to improve further. I know many people have written about this before and really, you don’t need to go much further than watching Austin’s butterfly to get the idea, but there are other great examples of great critique out there. I often show them clips from ‘Masterchef, The Professionals’ as great examples of giving critique which moves the expectations of the chef closer to excellence. There is often a place for giving examples of bad critique- X Factor style to show how not to do it. 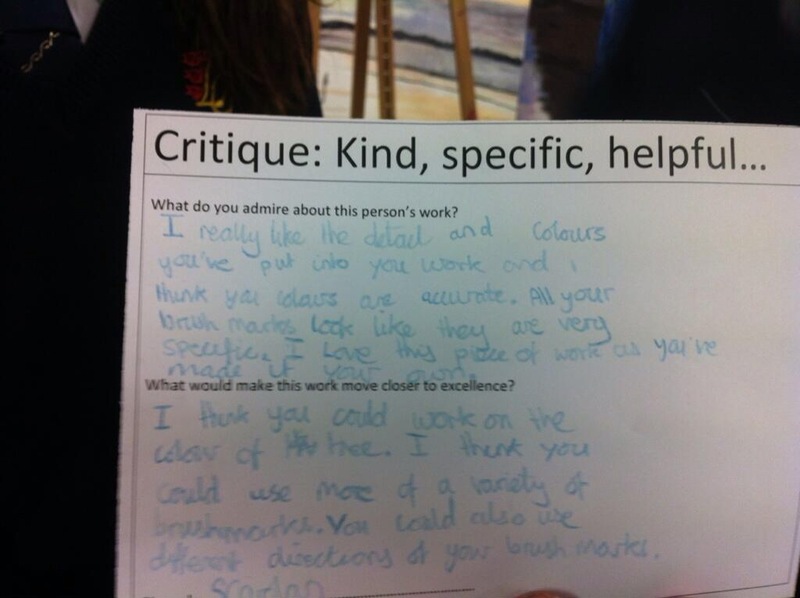 Critique needs to be developmental. It needs to be accessible to the learner and grounded in the criteria of what is being learnt or practiced. So. That’s us. How my department look to explore, understand and make the leap towards excellence with as many students as we possibly can.